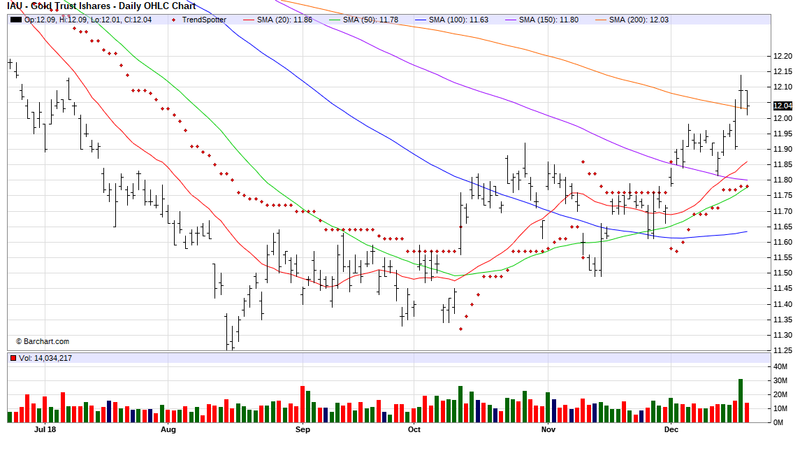 The Barchart Chart of the Day belongs to the Gold ETF Gold Trust Ishares(IAU). The reason I picked this ETF is to answer a question I am often asked: When you are in cash and sitting on the sidelines should I consider gold? Cash vs Gold for me is an easy play. I chart the price of this ETF just like I would a stock and if its trading above its moving averages I buy it, if it is trading below its moving averages I'm in cash. Set your stop loss at the 20, 50 or 100 day moving averages, depending on your point of view and make a little money while you wait. The iShares Gold Trust (the Trust) seeks to reflect generally the performance of the price of gold. The objective of the trust is for the value of the iShares to reflect, at any given time, the price of gold owned by the trust at that time, less the trust's expenses and liabilities. The trust is not actively managed. It does not engage in any activities designed to obtain a profit from, or to ameliorate losses caused by, changes in the price of gold. The trust receives gold deposited with it in exchange for the creation of Baskets of iShares, sells gold as necessary to cover the trust expenses and other liabilities and delivers gold in exchange for Baskets of iShares surrendered to it for redemption. Disclosure: I am/we are long IAU.